Preheat oven to 425°F (220°C). In a large mixing bowl, sift together the flour, 3 tbsp (45 mL) sugar, baking powder and cinnamon. Stir in the ground almonds. Use fingertips to rub the cheese into the flour mixture until it resembles coarse meal. Stir in the milk until the dough holds together. Drop 8 equal-size spoonfuls of the biscuit dough onto a parchment paper-lined baking sheet. Bake until the tops are lightly browned, about 10 to 12 min. Cool on a wire rack to room temperature. Meanwhile, heat the jam in a small saucepan over medium heat until runny. Remove from heat, mix in the sliced strawberries and set aside. Using an electric mixer, whip the cream with remaining sugar and vanilla to stiff peaks. Cover and refrigerate until needed. To serve, slice biscuits in half crosswise. 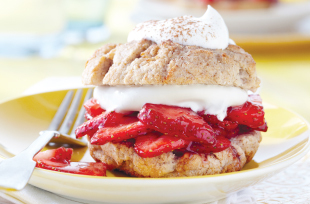 Divide strawberries evenly over the 8 biscuit bottoms. Top each with about 1 tbsp (15 mL) of whipped cream, cap with biscuit tops and finish with a dollop of whipped cream. Sprinkle with cinnamon, if desired, and serve.